Yue ZQ, 2013. On incorrectness in elastic rebound theory for cause of earthquakes, Proceedings, 13th International Conference on Fracture, June 16-21, 2013, Beijing, Paper No.S20-003 of Session S20, pp: 1-10. Yue ZQ, 2013. On nature of earthquakes with cause of compressed methane gas expansion and migration in crustal rocks, in Proceedings of Fifth Biot Conference on Poromechanics in Memory of Karlvon Terzaghi (1883-1963), July 10-12, 2013, Vienna, Austria, edited by Christian Hellmich, Bernhard Pichler and Dietmar Adam, ÓASCE, ISBN/ISSN:9780784412992，pp. 507-516. 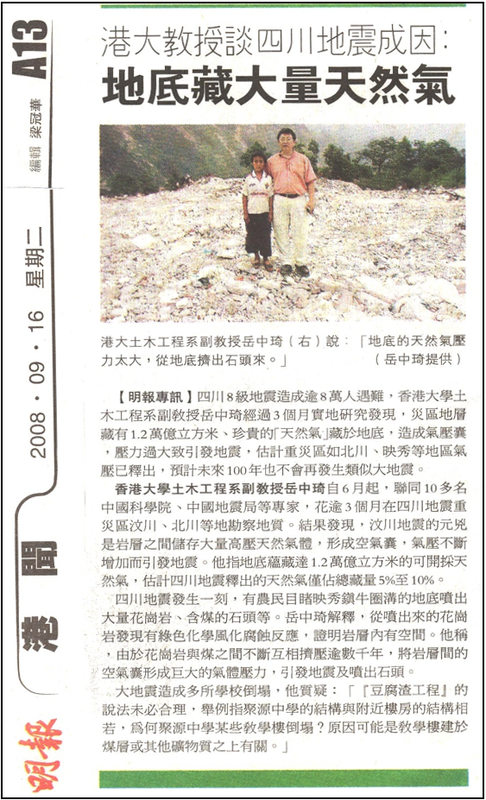 ZQ Yue, 2014.On cause hypotheses of earthquakes with external tectonic plate and/or internal dense gas loadings, Acta Mechnica, 225,1447–1469 (2014), DOI 10.1007/s00707-013-1072-2. This paper examines and compares the two loading systems and their associated energy and basic stress fields in elastic crustal rock mass for the cause of tectonic earthquakes. The first loading system is an external loading system and associated with the conventional earthquake cause hypothesis of active fault elastic rebounding. The second is a combined loading system where the first external loading system is added with a dense gas loading in the interior of deep crustal rock faults/defects. It is associated with the methane gas hypothesis for the cause of tectonic earthquakes. Five elastic stresses in rock solids with some idealized faults and caverns are presented to illustrate the similarities and differences of the stress fields and the possible rupture failure modes in association of the two loading systems. The theoretical results can show that any changes in the local stress concentrations due the external loading alone can be reflected and noticed in the corresponding stresses at the far field. On the other hand, any changes in the local stress concentrations due to the internal gas loading cannot be observed and distinguished in the tectonic stress field at the far distance. These theoretical results can beused to well explain the consensus of earthquake unpredictability with present technology. The theoretical results can further show that the external tectonicloading alone can only cause shear ruptures in crustal fault rocks with high compressive stresses, and such shear rupture or frictional failure is also difficult to occur because its shear plane has extremely high compressive normal stress. The combined loading can cause not only shear ruptures, but also tensile ruptures in crustal fault rocks, and such shear and tensile ruptures occur much easier since the rupture plane can have very low compressive or even high-tensile normal stress. It is argued that the earthquake energy is the volumetric expansion energy of dense gas mass escaped from the deep traps along crustal rock faults. The migration and expansion of the escaped dense gas mass in the crustal rock faults and defects cause the seismic body waves, the ground sounding, the seismic surface waves, the ground co-seismic ruptures and damages. Its rapid migration and expansion in thick water cause tsunamis in lakes and oceans. Its rapid migration and expansion in the atmosphere cause the sky to become cloudy. The dense methane gas is produced every day in the mantle and core of the Earth, migrates outward and accumulates and stores beneath the lower crustal rock in high compression. It forms a thin spherical layer of dense methane gas separating the cold crustal rocks and the hot mantle materials. Its leaking along deep faults or plate boundaries causes earthquakes and supplies to shallow gas and oil reservoirs beneath secondary traps in adjacent basins of the upper crustal rock mass.